Vincent Bach have taken the Stradivarius all trumpet players know and love and evolved it for a new generation of players. Utilising new materials with vintage Bach design and craftsmanship, these instruments offer versatility and a great sound, suitable primarily for commercial, lead and studio playing. The new 1B is Bachs first real step into designing a specific commercial/studio style Trumpet. This really means that they have focused on projection, volume, breadth of tone and flexibility at the extreme registers. Bach have used the #1 bell design, the first ever bell sketched by Vincent Bach himslef and to which he attributed the following words 'plays especially well in high registers'. The production of this bell involved testing of various materials with top players around the world and a lightweight bronze material was decided upon. 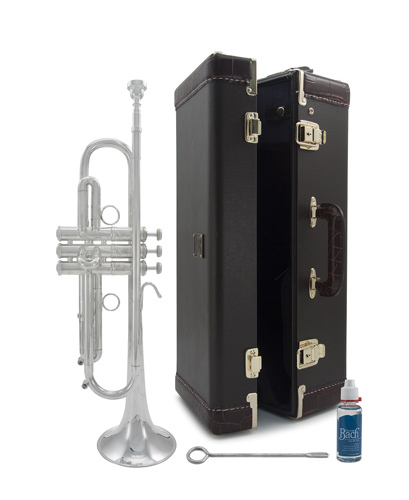 The resonance and flexibility of this bell is matched by the lightweight body design of the 1B and makes this trumpet a really lively and responsive instrument to play. Please click here to see a video introducingt he 1B features and design from the Vincent Bach Product Manager.